Can I Replace Just the Outside Portion of My AC? The outside portion of your air conditioner is done for. It’s served you well these last several years, but your technician tells you that repairing the broken down condenser is not possible or that it is just not worth the cost with a high risk of failure later on. It’s time to replace the outside condenser, but do you have to replace the indoor unit as well? It’s tough to say. Posted in Air Conditioning | Comments Off on Can I Replace Just the Outside Portion of My AC? Replacing an air conditioner can be a stressful experience. We’d like to make the process a little bit easier by giving you one valuable piece of advice: choose a high-efficiency system rather than a low-budget unit. Even if funds are low, it’s worth it to go with a high-efficiency air conditioner based on the savings you’ll see each month. Here’s how to find the right system for your home. Determining when your air conditioner should be replaced can be difficult when it hasn’t broken down completely. If there’s a chance that your air conditioner can be repaired, you have a tough choice to make when deciding whether or not it’s worth it. 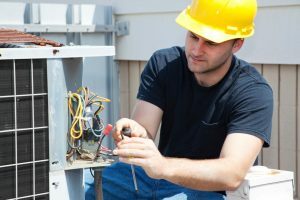 While this is a decision we think you should make with your local HVAC technician, we’ve provided a guide to a few of the times you can tell that your air conditioner should be repaired and not replaced. Posted in Air Conditioning | Comments Off on When Should You Replace Your Air Conditioner? Can Your Air Conditioning Problem Be Repaired? If you have an older air conditioner, it can be tough to guess whether a problem is indicative of a failing system. Unless you have experience repairing air conditioning systems, it is not so clear whether an air conditioning issue means that it needs to be replaced. You hope repairs are possible, but you do not want to repair a system that will only break down again sometime soon. While only a contractor can tell you for sure, here are a few signs that air conditioning replacement may be the best option. Posted in Air Conditioning | Comments Off on Can Your Air Conditioning Problem Be Repaired? Is Now the Right Time to Replace My AC? As the long hot weather season in Florida begins to get into gear, you’ll begin thinking about how your current air conditioning system will hold up. If you have a fairly new AC, you shouldn’t have much to worry about as long as you have regular maintenance done during the spring to keep it fine-tuned. However, for an older air conditioner, you may wonder if perhaps the time is right—before the extreme heat strikes—to replace it with a newer system. Choosing to have new air conditioning installation in Miami, FL takes commitment, but it may be the most long-term economical and short-term comfortable path to take. Air on Demand can make the process easier for you, and with our help, you’ll know if you need to repair or replace your AC, and you’ll have the trained and professional assistance necessary to do either. The first step in deciding whether or not to replace your current air conditioning is to check on the manufacturer’s estimated lifespan for the system. If your air conditioner has met or exceeded it, then you’ve already received a great bargain from it and should consider a replacement before the AC begins to deteriorate and cost money in upkeep. You should consider this even if the older system appears to be working fine. 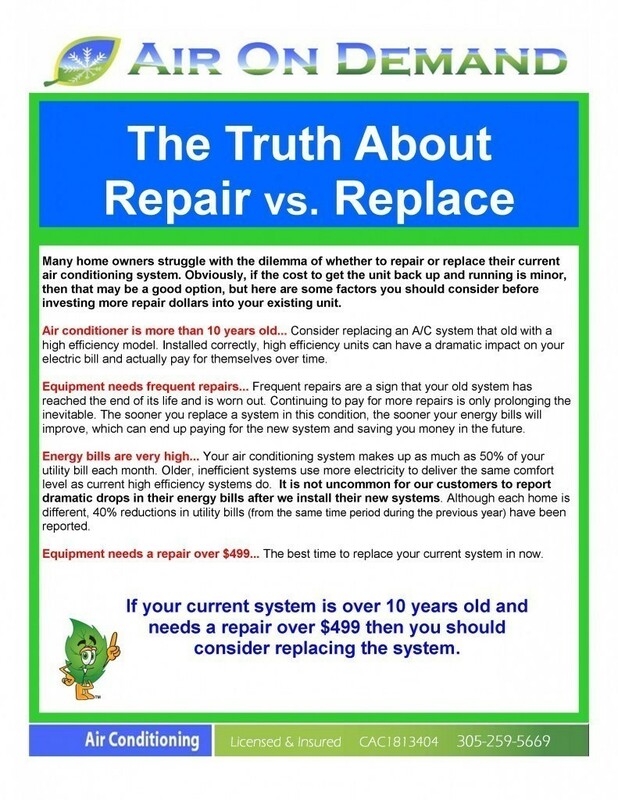 A replacement may be necessary for a system a few years younger than the expected lifespan if it has shown signs of consistent poor performance that repairs and maintenance have not improved. Look over your cooling bills for the last few years: if you notice a steady increase, despite regular maintenance, then your system is aging and should be replaced. Check over repair bills: a continual need for repairs also means a system past its prime and in need of a replacement. You may also wish to change out your air conditioner to take advantage of a more efficient system that benefits from recent technology. Some customers decide to switch over to a heat pump instead of an AC so they can have cooling and heating in one package. If you want a professional opinion regarding a replacement AC, contact heating and cooling specialists and let them look over your current system. They will help you make the best choice for your comfort and your budget. Let them handle the installation as well, if you go that route, so your new air conditioner/heat pump will work the best it can. Air on Demand offers excellent air conditioning installation service in Miami, FL. Make us your first call when you prepare for the summer. Posted in Air Conditioning | Comments Off on Is Now the Right Time to Replace My AC? Miami Air Conditioning Question: How Do I Know When to Replace My Air Handler? The air handler in your Miami home is incredibly important. Whenever you change the thermostat to turn on your air conditioning or heating system, the air handler goes into action. Within the unit, the fan blower motor turns to move air from the heating or cooling unit into the ductwork, so it can be delivered to you through your home. If the air handler is not working properly or if it is showing signs of age, it may need to be replaced to ensure optimal efficiency from your Miami HVAC system. Here are a few signs that your air handler may be at the end of its useful lifespan. The most common sign that an air handler is ready to be replaced is if the efficiency of your heating and cooling system suddenly drops through the floor. Maybe you are not getting even heating or cooling in every room of your home, or maybe your heating and cooling system suddenly costs much more operate. In either case, it could be due to a failing air handler which needs to be replaced. If the air-quality in your home starts to suffer, it could be due to the filters not working properly in your air handler. Sometimes it is just a clog or a bad filter. Other times, however, it can be due to the air handler itself not working properly. Obviously, if you are calling in an expert to visit your home and perform AC repairs on your air handler seemingly every week, it might be more cost-effective just to have a new system installed. You can talk to a technician to discuss whether or not the price of installation will offset the cost of all those repairs. If you have an old air handler, often when you upgrade your heating or air conditioning system, it is recommended to have a new air handler installed as well. Your technician will generally recommend to you whether this is necessary, but it is important to keep in mind in case you are planning on having a new furnace or air conditioner installed in the future. Your air handler is incredibly important, so if it is showing signs of wear or if you think it may need to be replaced, take it seriously and have a Miami air conditioning professional Air On Demand inspect the system right away. Posted in Air Conditioning | Comments Off on Miami Air Conditioning Question: How Do I Know When to Replace My Air Handler? Should You Repair or Replace Your Current AC System? Should you repair your current air conditioning system or is it time to upgrade and replace? We often have customers asking themselves this very question. We have created this sheet to help provide some information about air conditioning repair and air conditioning replacement in the Miami area. You may need to schedule a repair call, or perhaps you would like to find out about the energy savings available with the most efficient AC systems. If you have any questions or would like more information on air conditioning upgrades call Air On Demand. Our skilled HVAC representatives can answer all of your questions. Posted in Air Conditioning, Air Conditioning Repair, Maintenance Plan/Comfort Club | Comments Off on Should You Repair or Replace Your Current AC System?